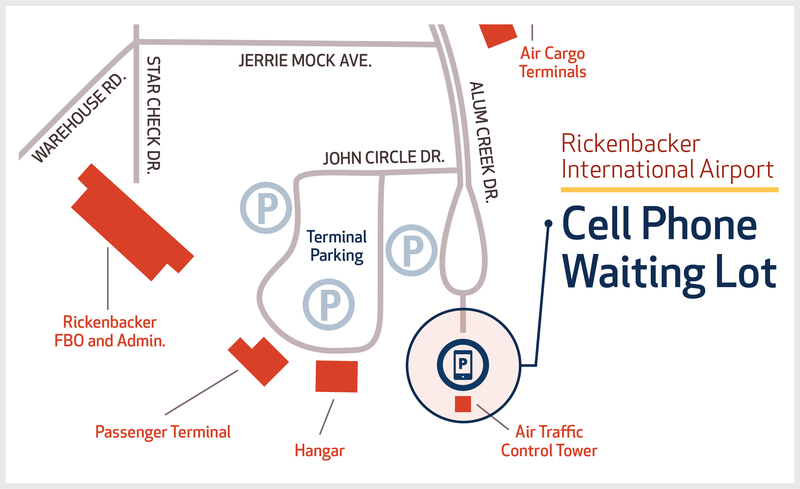 Parking is available directly in front of the Rickenbacker Passenger Terminal where Allegiant flights take off and land. Motorists waiting to pick up arriving passengers can park in a secure, well-lit area adjacent to the Rickenbacker Passenger Terminal. While driving toward the terminal on Alum Creek Drive, follow signs for the cell phone waiting lot, which is located within the parking lot of the Air Traffic Control Tower. Contact Enterprise Rent-A-Car at (614) 836-2500 to arrange to be picked up and transported to their southeast office location for your rental. Their shuttle operates Monday-Friday, 7:30 a.m. to 5:30 p.m. Check local listings to make taxi arrangements. The approximate fare into downtown Columbus is $40.